About three weeks ago, we announced our biggest event project ever since the conception of bernos over two years ago. That is the planning committee minus a few that we talk to over the phone. 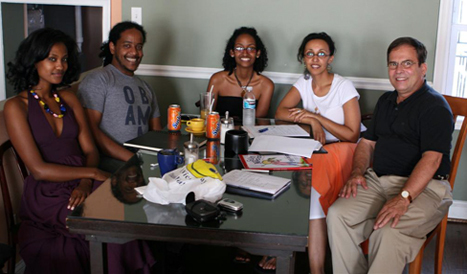 Dawit was on a plane back during our first meeting the first week of August. We believe it will be a success, but we have been getting a few emails asking what the bottom line is on the event. What exactly will happen on October 11th? Well, it’s quite simple actually, we have invited Ethiopian authors and others involved in the publications industry to come and attend a cocktail soirée. Latterly, it’s a party, a cocktail party. No loud music and no long self at the bar fighting to get your drink. ‘Cocktails for Reading’ will be held in Touchstone Art Gallery in China Town of Washington DC. Yohannes Gebregeorgis of Ethiopia Reads; and Elias Wondimu, founder & publisher of Tsehai Publishers and Distributor. Event hosted by Ellias Fullmore from burntface. Afrobeat is combination of jazz, funk rhythms, Yoruba music, percussion and vocal styles. Oct 15th marks Fela Kuti’s birth day, the king of afrobeat! We’re starting the party early. And this is also the Official After Party after the ‘Cocktails for Reading!’ party! Let’s celebrate as we dance to sounds of afrobeat as well as an eclectic mix from the east, west, north and south. Afrobeat will be at Penang, 1837 M st NW. Published by Nolawi October 1st, 2008	in African, Bernos, Noteworthy and Social. I will definitely join you guys for the After Party at Penang. YOu should actually come to the before party then the after party! this will be really fun I am sure of it! aaawwwwe! sounds really cool– I’ll send my reps! but yea…it’d be way cool to meet some authors and writers minamin. hope it gets a good turn out and that i’ll be able to squeeze it in this hectic weekend. best of luck! sarcasm sewit? tsk tsk tsk. I anticipate making best utilization of my time period where tweeting. in all of our sites for as long as feasible.. Very useful information specially the ultimate phase I care for such info a lot.